We live in a world in which business is more global than ever, and the need to leverage scarce resources to build skills in those businesses is critical. All of this provides more impetus to use virtual training on an even broader scale. Unless you have someone who is very experienced and comfortable with the delivery platform, it’s generally a good idea to use a second person/co-facilitator to manage the technology (monitor and respond to chats, troubleshoot and liaise with IT, launch polls or other planned interactions, and help with slides and annotations as needed) so the lead instructor/facilitator can focus on content delivery. Test the session tools in advance. This means scheduling a full walkthrough where facilitators launch and manage sign in, interactions, presenting/screen sharing, multimedia, toggling to the whiteboard, and any other features that will be used. View the session from the participant perspective as well. In fact, it’s a good idea to invite a few test participants to your walkthrough so you can be sure directions are clear and that user functionality works as it should. Have a back-up plan should the technology fail. 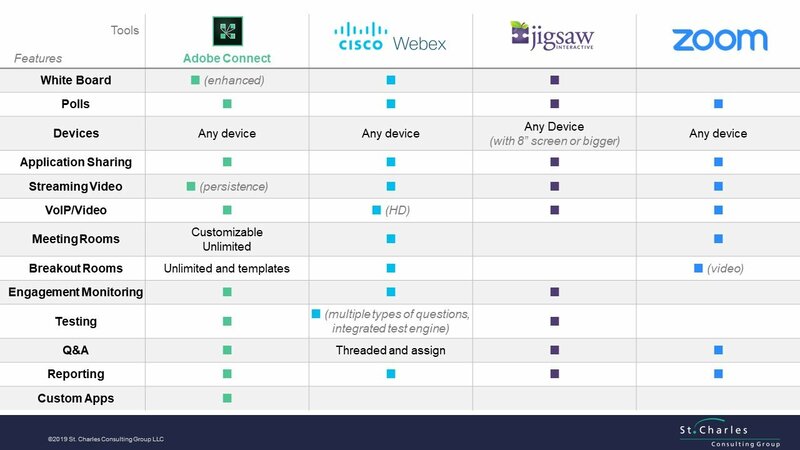 The image shown below shows a comparison of the top rated tools being used when delivering a virtual learning session. Ask learners to sign in early to the session. Have something for them to look at or do. I like to play a slide rotation that includes presenter photos and bios, preferred meeting etiquette (such as muting your phones or microphones, for example) and perhaps some trivia or maybe a request that they enter something in the chat or on the whiteboard (their local weather, perhaps, a New Year’s resolution, or just a hello and their location). Ask people to mute (and/or plan to control the mute from within the presenter tools). State up front how you will take questions—from within the chat, via a status indicator, verbally, etc. Also, state, whether learners should interrupt with questions or there will be a specific time(s) for questions during the presentation. Make use of the available tools to strengthen and enrich your content. Have compelling interactions about every 15 min., if possible, and be sure to incorporate practical exercises. Create exercises and interactions in advance. If you are creating CPE-compliant materials for a specific industry, you may be required to conduct specific types of interactions within specific time frames; be sure to check standards for your industry and design with those in mind. Exercises or practice opportunities should be relevant, and as realistic as is possible. This will likely require creative thinking and a deep look at your learning objectives. A good instructional designer can help. If you do a live demonstration of anything outside of your platform, click through more slowly than you normally would. People may have looked away if they were reading the chat, for example, or their screen changes may render more slowly than yours (especially if your audience is not all from the same organization, or there is not a standard operating environment within the organization.) If connectivity is an issue, an alternative is to incorporate step by step screen images into a slide presentation. Be aware that audio and video may require importing or other accommodations to work through a virtual platform (so again—test). Get comfortable with a little bit of silence as you present. You may feel like you are talking to yourself, especially if you are alone in a room with your computer. It can help to be co-located with other presenters. I have found it to be crucial to see the learner’s view of the session in real time while you are presenting. Surprisingly, not all platforms include this as part of the presenter toolkit. If you are not able to view the session through the learner’s eyes, it is even more important you have a co-facilitator managing the technology and seeing what your participants see. As a virtual facilitator, you and your team need to be comfortable in advance, make sure everything will work as planned and design your learning experience to be as engaging and seamless to learners as possible. If you’ve created meaningful exercises and interactions (that support strong, job-focused objectives), timed them well in the flow of your presentation, and have a strong co-facilitator managing the virtual platform and tools—learners can be fully engaged even if they are not visible or co-located. If you want your virtual training to be effective as well as efficient, just remember Chi, the Chinese term for that which gives life. But in this case, it stands for Compelling delivery, High energy, and Interaction. These three things will give life to all of your virtual sessions! Do you have any tip and techniques you prefer to use when delivering a virtual learning session? We would love to hear about them. Click the button below and let us know!